Aim: To compare the incidence and intensity of post-obturation pain after single or multi visit root canal treatment on single rooted teeth in a randomized controlled trial. Materials and Methods: Two hundred patients requiring root canal treatment on permanent single rooted teeth (both vital and non vital) were included. The patients were assigned randomly into two groups of 100 patients each. The teeth in Group1 (n = 100) were obturated at the first visit, whilst those in Group 2 (n = 100) were obturated in a second visit 7 days later. A modified Heft Parker visual analog scale was used to measure pre-operative pain and post-obturation pain at 6, 12, 24 and 48 hours after obturation. Independent-sample T-tests was used for statistical analysis. Results: Twelve patients were excluded from the study as they failed to follow the scheduled revisit. Data were obtained from the remaining 188 patients. There was no statistically significant difference in the incidence and intensity of post-obturation pain experienced by two groups. Conclusions: The incidence and intensity of post-obturation pain experience following one- or two-visit root canal treatment on teeth with a single canal were not significantly different. With the evolution of newer techniques, instruments, materials and better understanding of the canal anatomy, the face of endodontics has totally changed. Hence, in the light of advancements in endodontics the debatable topic of number of sittings need to be taken to perform a root canal treatment should be reconsidered. A one visit root canal treatment is attractive to a patient because it saves time and would probably reduce the cost of the procedure. In addition one visit treatment would be expected to be less stressful to the anxious patient. The patient is not disturbed by the additional anesthetic injections, the replacement of the rubber dam, the initial placement and later removal of intracanal medication and seals, and the time spent by the clinician in refreshing his memory and tactile sensation regarding prepared canal anatomy, tooth length etc. Furthermore, the problems of intervisit leakage, loss of temporary seal, or any of the accidents that can and do occur between the visits are solved. Perhaps the most important advantage is the prevention of root canal contamination and/or bacterial regrowth that can occur when the treatment is prolonged over an extended period. This randomized controlled trial aims to re-establish the relationship between the incidence and/or severity of post- operative pain and the number of treatment appointments using 'crown down' technique with rotary NiTi instruments. The study and informed consent forms were approved by committee on human research. Patients were recruited from the regular pool of patients visiting the endodontic department for root canal treatment. Patients who were pregnant, taking antibiotics or corticosteroids at the time of treatment, with immunocompromised, complicating systemic disease or below 18 years of age were excluded. Oral and written informed consents were obtained from all participants. Only one tooth with a single root of each patient was included, and the pulpal vitality determination was based on both the results of electric pulp tester (Analytic Technology Corp., Redmond, WA, USA). The vitality of pulps was ultimately confirmed by direct clinical observation of hemorrhage in the canal, without considering the clinical diagnosis as being a normal pulp, reversible pulpitis, or irreversible pulpitis. All teeth had completely formed foramina and no calcified canals, which were preliminarily evaluated by preoperative periapical radiographs. Any tooth with periodontal disease or periapical radiolucency of more than 0.5 cm was excluded. A total of 200 patients aged 20-60 years, were recruited. Patients were randomly assigned to either one- or two- visit treatment by biased coin randomization, a dynamic randomization method, which was specially designed to get the same number in both groups, and the sequence, tossing coin and allocation were operated by a graduate student who was blind to the nature of the study. One hundred patients received one-visit treatment (Group1), and 100 patients received two-visit treatment (Group 2). The clinicians were trained to use a modified Heft Parker visual analog scale. Patients were instructed to place a mark on the horizontal scale to represent the intensity of pain experience; furthermore, they were asked to use the verbal descriptors as a guide. Patients recorded their pre-operative pain level by using a VAS in the presence of a clinician to ensure that they understood the instructions. After treatment, the patients were given the VAS forms and contacted by telephone at each post-obturation interval to remind them to complete and return the forms. After receiving the VAS forms, the data was recorded for the remaining four intervals, which corresponded to post-obturation periods of 6, 12, 24, and 48 hrs. The standard procedure for both groups at the first visit included local anesthesia, rubber dam isolation, pulp extirpation and standard access preparation. Following canal patency confirmation when an electronic apical location '0' reading was achieved by a size 10 K-file, canals were prepared with a combination of hand files and ProTaper engine-driven rotary nickel-titanium files (Dentsply Maillefer, Ballaigues, Switzerland) following the manufacturer's instruction. RC Prep (Premier Dental Products Co., Philadelphia, PA, USA) was used as a lubricant. Irrigation was performed with 2.5% NaOCl after each instrument in all cases. Apical enlargement was accomplished by the finishing instruments, which ranged from F1 to F5 depending on the initial diameter of the root canals. At the first visit, all teeth were prepared to working length and dried with paper points. Canals in Group 1 were filled with ProTaper universal gutta-percha (Dentsply Maillefer) and AH plus sealer (Dentsply DeTrey GmbH, Konstanz, Germany), using a lateral compaction technique, and restored with temporary restorative material, Cavit-G. Following instrumentation, teeth in Group 2 a sterile dry cotton pellet was placed in the pulp chamber and the access was temporarily sealed using Cavit-G. Patients in Group 2 returned for the second visit 1 week later when the root canals were filled and teeth temporarily restored using the same technique and materials as in Group 1. Although, no systemic medication was prescribed, the patients were instructed to take 600 mg ibuprofen only if they experienced intolerable pain. They were asked to record the maximum pain level before they took the analgesics. Any patient with intolerable pain was requested to visit the clinician for emergency treatment. Forty-eight hrs after obturation, all the patients returned to the clinic with the VAS forms and reported the occurrence of post-obturation pain. The data thus obtained was submitted for statistical analysis. The VAS data was analyzed-using independent- sample T-test to compare the incidence of pre and post- operative pain at all the time intervals amongst the two groups. Differences were considered significant when probabilities were <0.05. Twelve patients (six patients from Group 1 and six from Group 2) were excluded from the study because they did not attend the recall visit and could not be contacted. None of the patients experienced flare-ups. Data were obtained from the remaining 188 patients [Table 1]. Ninety four patients had root canal treatment performed in one visit (Group 1) and 94 had treatment completed over two visits (Group 2). Independent-sample T-test revealed no significant difference in the incidence of pre-operative pain and post- obturation pain at all intervals between the two groups. The incidence and intensity of post-obturation pain, in both groups were gradually reduced over the study period. Similarly no statistically significant differences were found in the pain levels between vital and non vital teeth treated in single or multi visit protocol at all time intervals. [Table 2] shows mean values and standard deviation of pain of all the patients at different time intervals. On applying independent sample t-test it is seen that no statistically significant differences exist in the pre-operative and post- operative pain levels of both the groups at different time intervals. 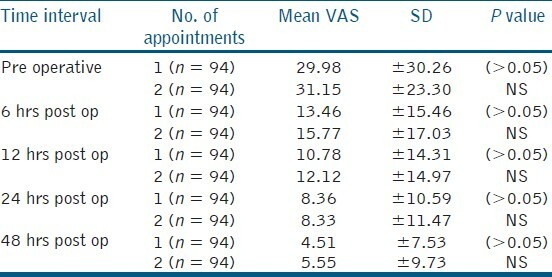 [Table 3] shows mean values and standard deviation of pain of all the vital teeth cases at different time intervals. On applying independent sample t test it is seen that no statistically significant differences exist in the pre-operative and post-operative pain levels of vital teeth of both the groups at different time intervals. 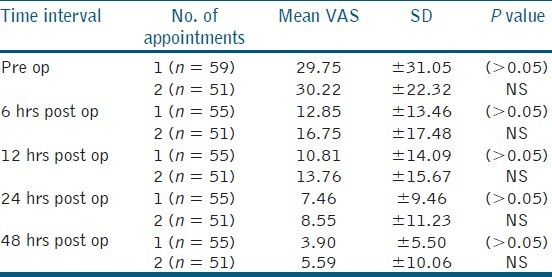 [Table 4] shows mean values and standard deviation of pain of all the non vital teeth cases at different time intervals. On applying independent sample t- test it is seen that no statistically significant differences exist in the pre-operative and post-operative pain levels of non vital teeth of both the groups at different time intervals. Two approaches have been proposed to solve this problem. In one case, residual bacteria are eliminated or prevented from repopulating the root canal system by introducing an interappointment dressing during the root canal treatment. The second approach is aimed at eliminating the remaining bacteria or rendering them harmless by entombing them in a complete and three-dimensional obturation, finishing the treatment in one visit, to deprive the microorganisms of nutrition and the space required to survive and multiply. In 1978, Ether and colleagues  and in the same year Soltanoff et al. examined incidence of pain while comparing the single and multiple visit endodontic procedures and concluded a significantly higher number of patients with no pain in the group that had the multiple-visit procedure than in the single-visit group. On the contrary James B. Roane et al. concluded a 2 to 1 higher frequency of pain reported following treatment completed in multiple visits as compared to that reported for those completed in one visit. Eleazer and Eleazer  compared flare up rate in endodontic treatment of pulpally necrotic molars and concluded that single visit endodontics is more advantageous over multi visit treatment. Mulhern et al  and Di renzo et al. in their studies and in a recent study conducted by C.Wang et al  on 100 vital teeth, no statistically significant differences were found between the pain levels of teeth treated in single and multi visit group. From the above discussed literature it is clear that although results of some studies are in the favor of single visit root canal treatment in terms of pain incidence and others favor multi visit procedures but the majority of literature published on the comparison between single and multi visit root canal treatment deny any significant difference in the level of post obturation pain between the two. In this in vivo study, no statistically significant differences were found in the incidence of pain between single and multi visit procedures. A comparison between post-obturation pain levels of vital and non vital teeth treated in single and multiple visits was also done. On the statistical analysis again no significant difference was found in the pain levels. It is generally thought that non vital cases require a medication in the canal between appointments to kill most bacteria but the expectations of benefits from intracanal medicaments may be exaggerated. For the medications to be effective, they must make direct contact with bacteria, which is quite an unlikely occurrence for those bacteria sheltered in dentinal tubules. Also, increase in the number of bacteria entering the root canal through a temporary barrier between the visits is a possibility. As such there is no assurance that the medication will certainly eradicate all the bacteria. There has been considerable debate in the literature as to the degree of effectiveness of intracanal medicaments after thorough instrumentation. L.R.G. Fava  conducted a study on 60 symptomatic upper central incisors, in which half of the teeth were obturated immediately and the other half were dressed with a calcium hydroxide paste and obturated at a later appointment. The author concluded no difference in pain incidence between the two groups. In this in vivo study no intra canal medicament was used in the two visit group. Cavit-G has been found to provide a good bacterial tight seal when used as a temporary restorative material in between the visits to close the access preparations. ,, In this in vivo study Cavit-G was a temporary restorative material to provide an effective bacterial seal in the multi visit group. From the results of this study and scientific literature, it is clearly evident that multi visit endodontics does not reduce the incidence of pain. The clinicians have also found that there is no evidence that in a single visit root canal treatment, quality of root canal treatment gets compromised. On the contrary, the evidence points in the direction of less pain with the single visit root canal treatment. Although single visit root canal treatment is encouraged, it is certainly does not mean that all of the endodontic cases be easily treated with single visit root canal therapy. One should carefully evaluate the case before making the decision to go for single visit or multi visit root canal treatment. 1. Ashkenaz PJ. One-visit endodontics: A preliminary report. Dent Surv 1979;55:62-7. 2. Oliet S. Single visit endodontics: A clinical study. J Endod 1983;9:147- 52. 3. Orstavik D, Kerekes K, Molven O. Effects of extensive apical reaming and calcium hydroxide dressing on bacterial infection during treatment of apical periodontitis: A pilot study. Int Endod J 1991;24:1-7. 4. Sjogren U, Figdor D, Persson S, Sundqvist G. Influence of infection at the time of root filling on the outcome of endodontic treatment of teeth with apical periodontitis. Int Endod J 1997;30:297-306. 5. Siqueira JF Jr, Favieri A, Gahyva SM, Moraes SR, Lima KC, Lopes HP. Antimicrobial activity and flow rate of newer and established root canal sealers. J Endod 2000;26:274-7. 6. Ether S, et al. A comparison of one and two visit endodontics. J Farmacia Odontol 1978;8:215. 7. Soltanoff W, Montclair NJ. A comparative study of the single visit and the multiple - visit endodontic procedure. J Endod 1978;4:278-81. 8. Roane JB, Dryden JA, Grimes EW. Incidence of postoperative pain after single- and multiple-visit endodontic procedures. Oral Surg Oral Med Oral Pathol 1983;55:68-72. 9. Eleazer PD, Eleazer KR. 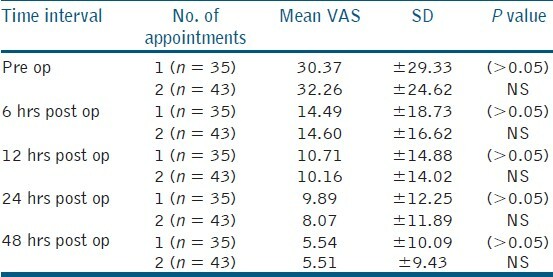 Flare up rate in pulpally necrotic molars in one visit versus two visit endodontic treatment. J Endod 1998;24:614-6. 10. Mulhern JM, Patterson SS, Newton CW, Ringel AM. Incidence of postoperative pain after one-appointment endodontic treatment of asymptomatic pulpal necrosis in single-rooted teeth. J Endod 1982;8:370-5. 11. DiRenzo A, Gresla T, Johnson BR, Rogers M, Tucker D, BeGole EA. Postoperative pain after 1-and 2-visit root canal therapy. Oral Surg Oral Med Oral Pathol 2002;93:605-10. 12. Wang C, Xu P, Ren L, Dong G, Ye L. Comparison of postobturation pain experience following one-visit and two-visit root canal treatment on teeth with vital pulps: A randomized controlled trial. Int Endod J 2010;43:692- 7. 13. Fava LR. A clinical evaluation of one and two-appointment root canal therapy using calcium hydroxide. Int Endod J 1994;27:47-51. 14. Çiftçi A, Vardarlý DA, Sönmez IÞ. Coronal microleakage of four endodontic temporary restorative materials: An in vitro study. Oral Surg Oral Med Oral Pathol Oral Radiol Endod 2009;108:e67-70. 16. Lee YC, Yang SF, Hwang YF, Chueh LH, Chung KH. Microleakage of temporary restorative materials. J Endod 1993;19:516-20. 17. Price DD, McGrath PA, Rafi A, Bukingham B. The validation of visual analogue scales as ratio scale measures for chronic and experimental pain. Pain 1983;17:45-46. Shaikh, A.G. and Kalhoro, F.A. and Dall, A.Q.